I often see people wondering how they can book a flight with a free stopover. For example, let's say you're looking at a normal, roundtrip flight from Toronto to London, UK with Icelandair. On any decent flight search site or app (or the airline's own website or app), you'll notice that listed beside 'Roundtrip' and 'One Way' there's a third option, almost always named 'Multi-City'. Here's a link to the Google Flights Multi-City search page for example. The Multi-City feature is the key to booking flights with an extended stop somewhere. And if all goes well, this multi-city trip to London with the extended stopover in Iceland (KEF) will cost the same as the regular roundtrip flight to London. You'll notice that for the Multi-City trip I've kept my departure and return dates the same as when I searched for a normal roundtrip flight. This isn't a coincidence. It's often easiest to start your search by looking for the cheapest roundtrip dates, and then use the same departure and return dates when searching for a multi-city flight. Keep the departure and return dates the same, but try playing around with the 'middle' date to give yourself more or less time in the stopover city. See how it affects the price. Tip: You can also try searching for a flight where the extended layover is on your way home instead of on the way there. It's possible that it might be cheaper, or more convenient flights. However, keep in mind that it's actually pretty rare for a multi-city flight with an extended stopover to cost the same as a normal roundtrip flight. Believe me, I know it would be nice if it were possible to extend the stopover length of *any* flight that you found, and have it work out to the same price. 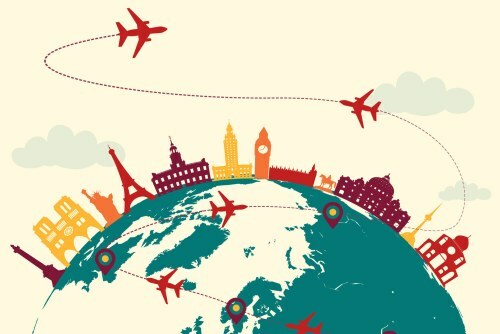 However, the reality is that the price of a flight with an extended stopover is set by the airlines, and very few airlines offer them for free. It almost always costs more. Often a lot more. And with the airlines that do offer a free extended stopover, the extended stop is only available for their main hub city. 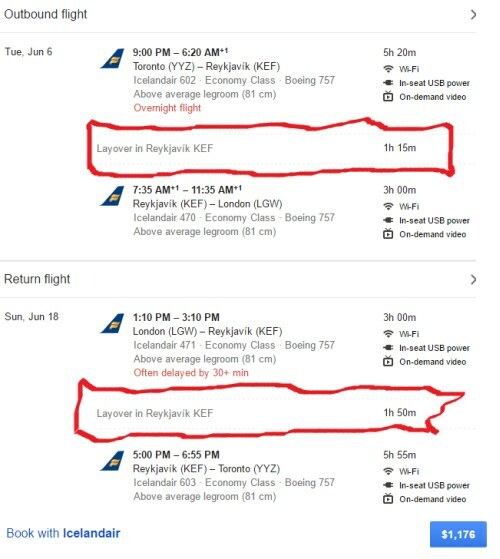 For example, Icelandair, as shown above, almost always offers free extended stops in Reykjavik, Iceland (KEF) - which is their hub, on your way from Toronto to the European cities that they fly to (London, Paris, etc). Icelandair - Usually offers free extended stops in Reykjavik, Iceland (KEF) on your way from Toronto to the European cities that they fly to. KLM - Sometimes offers free extended stops in Amsterdam, Netherlands (AMS) on your way from Toronto to the cities in Europe, Africa, or the Middle East that they fly to. Air France - Sometimes offers free extended stops in Paris, France (CDG) on your way from Toronto to the cities in Europe, Africa, or the Middle East that they fly to. Turkish Airlines - Has been known, on occasion, to offer free, or nearly free extended stops in Istanbul, Turkey (IST) on your way from Toronto to cities in Europe, India, The Middle East, and Africa. British Airways - Has been known, on occasion, to offer free, or nearly free stops in London, UK (LHR) on your way from Toronto to cities in Europe. All Nippon Airways (ANA) - Has been known, on occasion, to offer free, or nearly free, extended stops in Tokyo, Japan (HND or NRT) on your way from Toronto to cities in SE Asia. Qantas - Has been known, on occasion, to offer free extended stops in Los Angeles (LAX) or San Francisco (SFO) on your way from Toronto to Sydney, Australia (SYD). - focus on the destinations listed above, and use the airline's hub city as the one that you extend your stay in. 4 Responses to "How to book flights with free stopovers from Toronto"
keep up the great work chris!! Thanks for your article Chris! I had a very enjoyable stop over in Singapore with Singapore Airlines, they make it easy to go into the city and at the time offered access to their airport lounge as well. And it was free.